The dunes stretched as far as the eye could see. Our dune buggy driver handed each of us a wooden sandboard. Out of his pocket he pulled a candlestick, broke it in half and gave a piece to each of us. He pointed to the sandboard, indicating that we should rub it on the bottom to help the boards go faster. I kneeled in the golden sand and peered over the dune. The first hill was at least 50 feet down. Is this the bunny slope in Huacachina? It was my second week in Peru and discovering PeruHop was an exciting find. 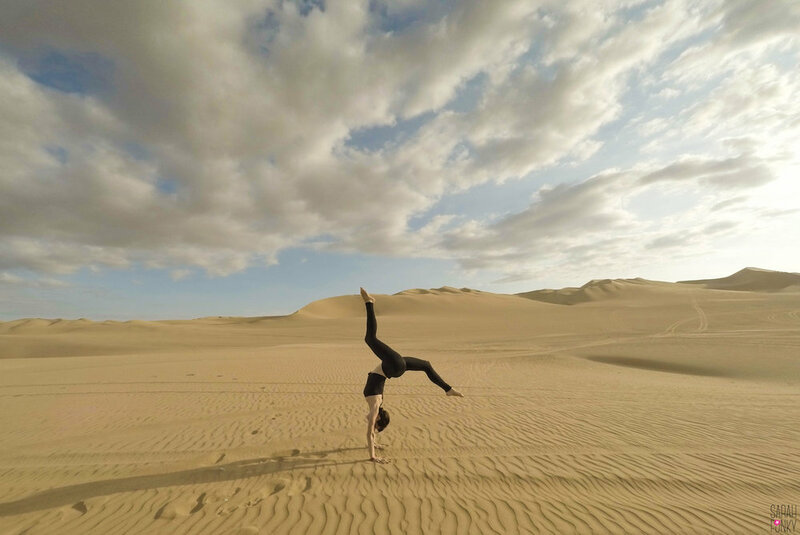 Their 3-day tour to Huacachina stood out to me since it was a well-rounded way to explore the countryside for a low price. Everything a traveler needs was included in the price; housing, transportation and activities. The only thing we needed to pay for was food and hotel upgrades, if desired. The sound of my alarm startled me from my slumber. Slowly, I squinted my eyes open. It was still dark. The clock read 5:45am. I was not happy, until I remembered that it was the first day of our trip. The bus picked us up from our hotel and we drove to the Cristo Del Pacifico; a huge Christ statue overlooking Lima. It was only 8am and Lima was still shrouded in a soft mist. From this view, it is clear that Lima has more than meets the eye. The metropolis is home to 10 million people, with the majority living outside of the city center. I had only lived in the city for two weeks when I decided to go on the PeruHop tour. As I gazed at the vista of Lima, it reminded me that I still had much to explore in this beautiful city. We hopped back on the bus and stopped for a quick viewing of Pachacamac; Lima’s simpler version of Machu Picchu. From here, we could see the ruins over the wall from our bus. The air was filled with sandy dust from the desert environment. I was happy that we could view it from the comfort of the bus instead of stepping into the dry, dusty environment. 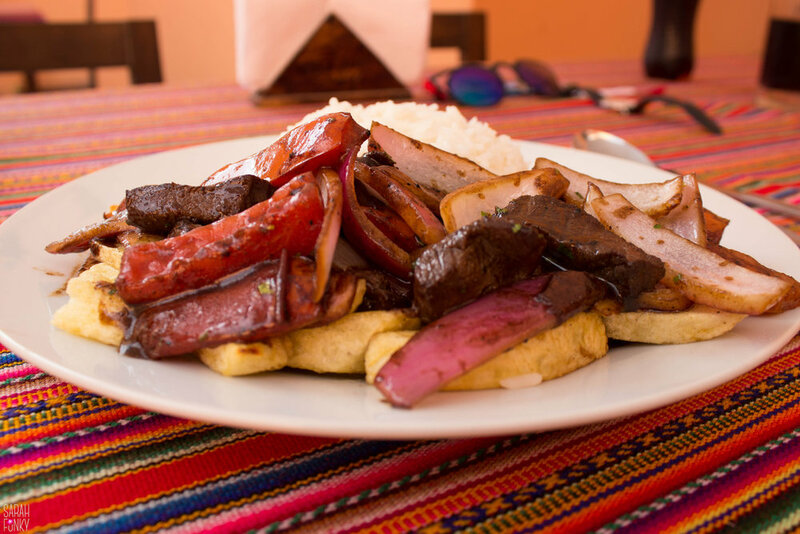 One of the pieces that stood out the most to me about Peru was the cuisine. I was never disappointed in any meal that I had during my stay. In fact, Lima is home to two of the top ten restaurants in the world. Travelers visiting should take pleasure in over-indulging here. For breakfast, we stopped at a unique bread oven that was home to one of the freshest breads in Peru. It was incredibly inexpensive and the bread was soft and warm. Just a few feet away, we could see the bakers making the fresh bread in stone ovens. I was in heaven! After a warm breakfast, we drove a few hours to the secret slave tunnels in Chincha. They are located in a beautiful estate called Hacienda San Jose. Originally, the owners had created the tunnels for safety reasons. However, has slavery spread into Peru, they expanded the tunnels 17 km to the Pacific coast and used them to illegally smuggle African slaves. Life inside the tunnel was difficult. We had the opportunity to explore the tunnels for a few minutes and it was scary. There was no light; it was cramped and musty. According to our guide, some of the slaves would stay there for several months at a time. I couldn’t imagine how terrible that must have been – we were only inside for 10 minutes and I couldn’t wait to get out. Modern day Chincha is famed for its regional food, music and dance that has resulted from the fusion of African and Peruvian cultures. Passing tourists often overlook this town but it is worth stopping by to break up a trip to Paracas or Huacachina. From Chincha, our bus driver drove an hour to Paracas, where we stayed for the night. Our PeruHop guide invited us to join her for dinner along with several of the passengers on the trip. It was fantastic getting to know our fellow travelers and hear their stories. To this day, I am still in contact with many of the travelers on the trip! That night Luis and I explored the nightlife scene in Paracas with a few of the PeruHop travelers. To put it lightly we indulged a bit too much on spirits and stayed out far too late. It was a night of dancing, laughter and great company. The next morning was painful though – we learned our lesson! After drinking several Gatorades to recover from our crazy night, we pulled ourselves together (as much as we could) and met the group for the two-hour boat tour of the Ballestas Islands. The sea breeze ran across my face and woke me up from my hung-over state as the boat left the harbor. To my surprise, it was incredibly refreshing being out on the water after a night out. 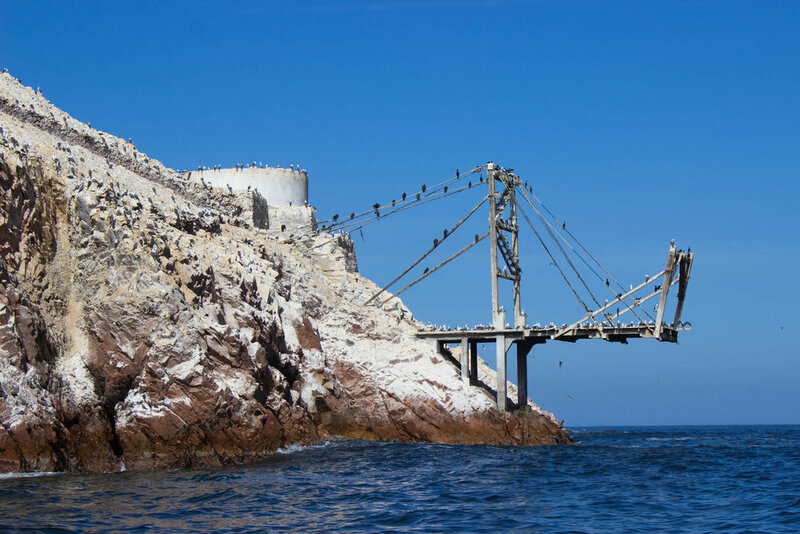 The Ballestas Islands are Peru’s version of the Galapagos. During our tour we saw sea lions, penguins and a lot of birds in their natural habitat, namely Boobies! The funny thing about sea lions is that they make a noise that sounds like a grumpy old man yelling. Our boat thought this was hilarious – there was much laughter on board! During our tour, we saw the famous candelabra – a soil and stone composition in one of the sandy islands. Historians are unsure when it was made and it’s significance. It was discovered in 1851, however, it could be much older. Hopefully one day we will know! We disembarked the speedboat two hours later and met at the bus for our tour of Paracas National Reserve. This is one of the biggest protected desert reserves in South America. To say this area is beautiful would be an understatement. The sandy desert stretched for miles in all directions and had vibrant tones of red, orange and yellow. Along the cliff face, crashing waves pounded the black sand beaches. It was breathtaking. At one point the area was home to the Paracas civilization that were known for their famous surgeons. They called the area home between 800 BCE and 100 BCE. They were known for putting holes in people’s heads and filling it with silver, gold, or copper (depending on the social status of the individual). They also were known to put wood around baby’s heads to make them longer (think alien heads) to distinguish themselves from other civilizations. After prancing around the desert for a few hours, we jumped back on the bus and drove to Huacachina. This unique town is home to a small natural oasis in the Ica desert. 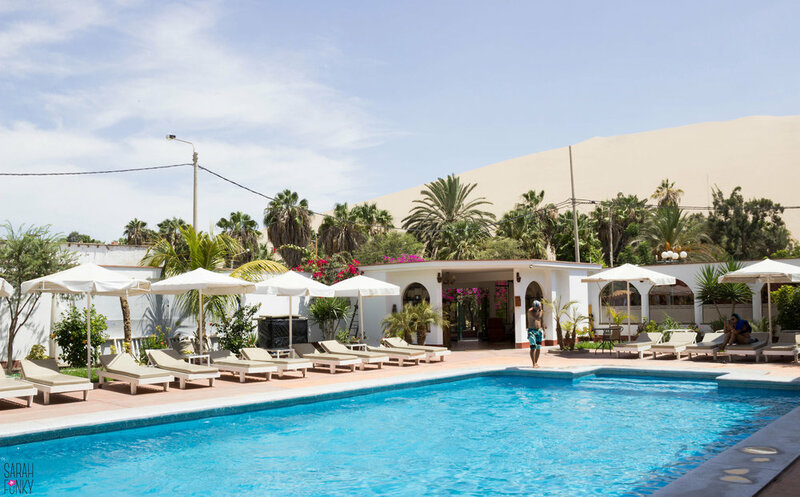 It is South America’s only desert oasis and a surprisingly unknown destination for what it has to offer. After checking into our hotel, we went to a BBQ hosted by PeruHop. It was all you can eat and drink at a reasonable price. The food was decent. I would recommend doing this if you are looking for an “all-you-can-drink” experience and not for culinary delights. There are many restaurants around Huacachina that are great if you would prefer more of a culinary experience. With our bellies full from the BBQ, we headed back to our hotel to get a good night sleep. As I drifted off to sleep, I dreamt of what the next day would have in store; a dune buggy ride and sandboarding. The sun lit up our room and gently woke us up with its warmth. It was a beautiful day in Huacachina – perfect for exploring the unique town. We had a simple breakfast at the hotel and then headed to the dunes early to explore. Huacachina has some of the highest sand dunes in the world. It is not an easy feat to climb them because of the sand, however, the views at the top are breathtaking and worth the hike. It took about 30 minutes to climb to the top because we slipped back several feet with every step. In comparison, it only took about 3 minutes to run down the dunes from the top. The sight was incredible at the top of the dunes. From one side, the landscape was a cityscape with the occasional dune plopped among buildings. The view on the other side was sandy dunes stretching as far as the eye could see. It was incredibly peaceful siting on top of the highest dune while gazing at the small oasis town. We were happy that we had woken up early to experience this as the suns rays were beating down with high temperatures by 9:00 am. I couldn’t imagine how hot it would get in the middle of the day. Later on, we had a two-hour dune buggy and sandboarding tour. This experience is something that should not be missed. We rode the dune buggies up and down the sandy dunes at high speeds. It was exhilarating! Next, came the moment that I had looked forward to the whole trip; sandboarding. I had seen this done before and as a surfer/snowboarder/skate boarder I was anxious to try boarding on sand. Our dune buggy driver gave us a brief run down on how to use the sandboard and then we were off. The dunes were massive! The final dune was about 200 feet high. I was nervous but sandboarding is simple as long as you follow the safety rules. I laid on the board and zoomed down the hill. My feet dug into the sand whenever I felt I was going too fast. Eventually, I got to the bottom. The sun had begun to set and reflected a gorgeous golden light on the dunes. With sand boarding successfully done, we hopped back in the dune buggy and headed to the bus, which would take us back to Lima. We said goodbye to our friends we had met and exchanged contact information. If I had more time, I would have loved to continue the journey with PeruHop. It was an easy, fun and safe way to travel around Peru and I highly recommend it to anyone who is visiting the area. We were guests of PeruHop, however, the opinions are our own. The total price for our trip was $159 per person. PeruHop offers tours ranging from 1 day to up to a month. To learn more visit PeruHop.com.